Kevin Young defends clients in product liability and insurance coverage matters. His civil litigation experience includes advising Fortune 500 insurance carriers in both state and federal courts. Kevin works with his clients to ensure they are informed throughout litigation. He is involved in all phases of the process—including pleadings, motions, depositions, and other discovery—through the eve of trial. Additionally, he has litigated up through appeal at every stage. 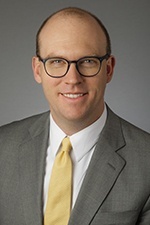 Prior to joining Hinshaw, Kevin practiced at a civil litigation firm in Chicago, where he was involved in hundreds of depositions and also worked on coverage issues. As a law clerk for a boutique firm in Chicago, Kevin assisted with a brief in opposition to petition for writ of certiorari in the United State Supreme Court. In addition to his other law school accomplishments, Kevin was named to the Dean's List multiple semesters. Kevin was the sole advocate for his client in a three day mediation involving 5 direct defendants and 35 third-party defendants. His low five figure settlement was the lowest of any direct defendant and one of the lowest in the 2.3 million dollar global settlement. Outside of the office, you will probably find Kevin riding his motorcycle or enjoying a show in Chicago's thriving stand up comedy scene.